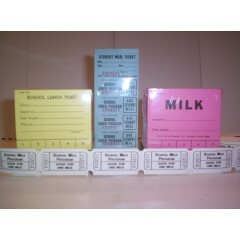 School Service offers a variety of lunch, milk, and food punch tickets. 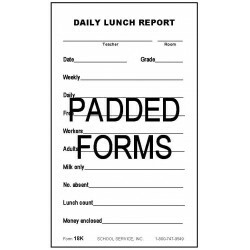 We offer Lunch Fee Envelopes and a padded Daily Lunch Report too. 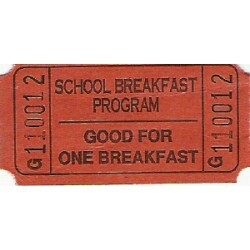 School Service has a limited amount of stock roll tickets. 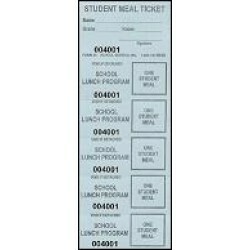 The selection includes: lunch, milk, breakfast, student activity, adult activity, refreshment, admission, coupon tickets, and blank roll tickets. Contact us at (800) 747-9549 to check availability. 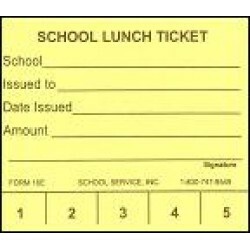 Check out our discounted roll tickets or all of our Discounts that School Service supplies. Punch tickets. Size: 3 x 5 size Type: Card stock paper Stock Paper Color: White Pin.. 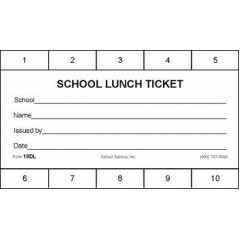 Lunch fee envelopes. 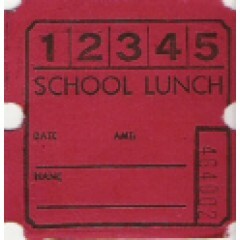 Size: 3 1/2 x 6 1/2 size Type: Envelope Available in: Kraft S..
Daily lunch tickets. Size: 2 1/2 x 3 size Type: Card stock paper Stock Paper Color: W..
Punch tickets. 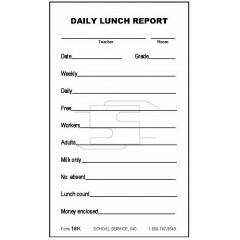 Size: 2 1/2 x 3 size Type: Card stock paper Stock Paper Color: White ..
Padded lunch report. Size: 5 x 3 size Type: Bond paper padded (note pad paper) Stock P.. Please call for price and availability - 1-800-747-9549. Roll tickets starting with A prefix. .. Please call for price and availability - 1-800-747-9549. Roll tickets starting with B prefix. .. Please call for price and availability - 1-800-747-9549. Roll tickets starting with C prefix. .. Please call for price and availability - 1-800-747-9549. Size: 1 x 2 size tickets Type: Roll t..
Punch tickets. Size: 2 1/2 x 3 size Type: Card stock paper Stock Paper Color: White Cust..
- Call 1-800-747-9549 for availability. - Roll tickets. - 2 x 2 size tickets. - Available i.. Please call for price and availability - 1-800-747-9549. Roll tickets starting with a number (no ..
We are clearing out our stock of roll tickets. We are offering roll tickets at very reduced, c.. Please call for price and availability - 1-800-747-9549. Great for raffle tickets! Size: 2 x 2..